Name Variation Claude George McFarland was also known as Claud. Claude George McFarland was born on 18 January 1905 at Bellingham, Whatcom, Washington. He was the son of George M. McFarland and Anna (?). Claude George McFarland married Freda Gwin, daughter of Joseph Clyde Gwin and Iva A. Spyker, after April 1930. Claude George McFarland died on 30 December 1997 at Bellingham, Whatcom, Washington, at age 92. Cameron W. Gwin was born on 2 February 1914 at Wisconsin. He was the son of Joseph Clyde Gwin and Iva A. Spyker. Cameron W. Gwin married Mildred Jeannette Harriman before 1943. Cameron W. Gwin married Lois M. (?) after 1976. Cameron W. Gwin died on 14 November 1998 at age 84. Cameron W. Gwin obtained US Social Security Card at Washington; last residence Burlington, Skagit, Washington. As of 1994, Cameron W. Gwin's address was 820 Hilynn Drive, Burlington, Skagit, Washington. [S250] U.S. Federal Census 1930 U.S. Federal Census, by Ancestry.com, ED37-20. Dwelling 80. Wendell Archie Gwin married Edythe Mae (?). Wendell Archie Gwin was born on 9 January 1923 at South Dakota. Wendell Archie Gwin died on 30 December 2000 at age 77. He was buried after 30 December 2000 at Mount Vernon Cemetery, Mount Vernon, Washington. Wendell Archie Gwin obtained US Social Security Card at Washington; last residence Mount Vernon, Skagit, Washington. 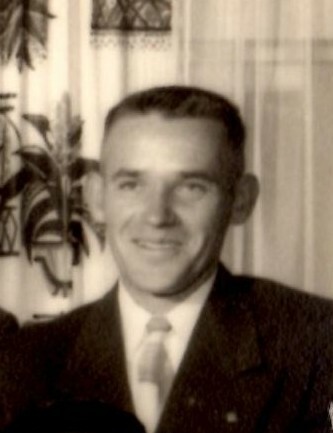 Nardy Walter Paulson was born on 26 December 1924 at South Dakota. He was the son of Martin Krohn Paulson and Opal Leith Gwin. Nardy Walter Paulson married Jessie M. Vincent, daughter of Albert F. Vincent and Ida C. Coats, after 1949. Nardy Walter Paulson died on 24 November 2007 at age 82. Nardy Walter Paulson obtained US Social Security Card at Washington; last residence Portland, Washington, Oregon. From 1942 to 1949 A man who served our country, in a time of need, 1st Class Signalman, USS Portland, WWII. He lived in 2000 at 1759 Hyland Street, Bayside, Humboldt, California. [S250] U.S. Federal Census 1930 U.S. Federal Census, by Ancestry.com, ED40-26. Dwelling 136. Mary C. Gwin was born on 16 June 1863 at Neptune, Richland, Wisconsin. She was the daughter of David J. Gwin and Martha J. Reagles. Mary C. Gwin died on 24 April 1942 at King, Waupaca, Wisconsin, at age 78. [S247] U.S. Federal Census 1870 U.S. Federal Census, by Ancestry.com, Page 32. Dwelling 231. Name Variation Laura Blanch Gwin was also known as Blanche. Name Variation Laura Blanch Gwin was also known as Blanch. Name Variation Laura Blanch Gwin was also known as Dollie. Married Name 7 August 1900 As of 7 August 1900,her married name was Davis. Laura Blanch Gwin was born on 11 July 1879 at Neptune, Richland, Wisconsin. Laura Blanch Gwin married Alfred John Davis, son of (?) Davis, on 7 August 1900. Laura Blanch Gwin died on 30 January 1967 at Richland Center, Richland, Wisconsin, at age 87. [S246] U.S. Federal Census 1880 U.S. Federal Census, by Ancestry.com, NA Film Number T9-1445 Sheet 100B. [S245] U.S. Federal Census 1900 U.S. Federal Census, by Ancestry.com, ED115. Dwelling 158. [S244] U.S. Federal Census 1910 U.S. Federal Census, by Ancestry.com, ED98. Dwelling 18. Name Variation Anna J. Gwin was also known as Amity J. Name Variation Anna J. Gwin was also known as Ammie. Married Name 15 September 1900 As of 15 September 1900,her married name was Smith. Anna J. Gwin was born on 18 November 1883 at Neptune, Richland, Wisconsin, also reported as Dec 1882 and 21 Nov 1883. Anna J. Gwin married Robert Pierre Smith on 15 September 1900. Anna J. Gwin died on 1 December 1973 at Madison, Dane, Wisconsin, at age 90. Anna J. Gwin had 3 with 1 living in 1910 children. [S244] U.S. Federal Census 1910 U.S. Federal Census, by Ancestry.com, ED98. Dwelling 1. Name Variation Susan D. Quackenbush was also known as Susie. Married Name circa 1898 As of circa 1898,her married name was Gwin. Susan D. Quackenbush was born on 11 February 1882 at Richland, Wisconsin. She was the daughter of Chauncey Melvin Quackenbush and Jennie Murray. Susan D. Quackenbush married Edward Thomas Gwin, son of David J. Gwin and Martha J. Reagles, circa 1898. Susan D. Quackenbush died on 9 October 1968 at age 86. [S244] U.S. Federal Census 1910 U.S. Federal Census, by Ancestry.com, ED103. Dwelling 83. Daniel Gwin married Mary Malina James, daughter of Reverand David James. Daniel Gwin was born in 1805 at Valley Forge, Pennsylvania. He was the son of John Gwin. Daniel Gwin married Melissa (?) after 1851. Daniel Gwin married Cordelia Ellis after 1855. Daniel Gwin died in 1877 at Spring Green, Sauk, Wisconsin. [S180] Wisconsin Sauk Co Cemetery Records Vol 6, page 107. [S249] U.S. Federal Census 1850 U.S. Federal Census, by Ancestry.com, Stamp 444. Dwelling 1331. Robert Pierre Smith was born on 3 August 1878 at Wisconsin. He married Anna J. Gwin, daughter of David J. Gwin and Martha J. Reagles, on 15 September 1900. Robert Pierre Smith died on 15 November 1967 at age 89. Robert Pierre Smith was a cheesemaker in 1900. [S245] U.S. Federal Census 1900 U.S. Federal Census, by Ancestry.com, ED115. Dwelling 3. Georgia Ione Smith was born on 3 September 1903. She was the daughter of Robert Pierre Smith and Anna J. Gwin. 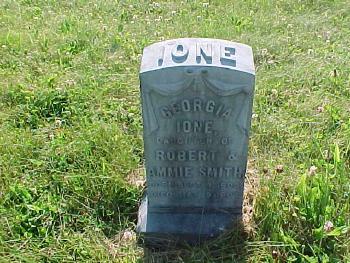 Georgia Ione Smith died on 9 May 1907 at age 3. She was buried after 9 May 1907 at Willow Valley Cemetery, Ithaca, Richland, Wisconsin. Myron R. Smith was born on 10 April 1906 at Wisconsin. He was the son of Robert Pierre Smith and Anna J. Gwin. Myron R. Smith died on 24 January 1981 at age 74. Name Variation Frederick Dudley Reed was also known as Fred. Frederick Dudley Reed was born on 25 August 1863 at Wisconsin. He was the son of George W. Reed and Sarah E. McCollough. Frederick Dudley Reed married Elnora M. Gwin, daughter of David J. Gwin and Martha J. Reagles, on 13 March 1889. Frederick Dudley Reed died on 2 June 1933 at age 69. [S246] U.S. Federal Census 1880 U.S. Federal Census, by Ancestry.com, NA Film Number T9-1445 Page Number 33A. Earl Adelbert Reed was born on 21 May 1890. He was the son of Frederick Dudley Reed and Elnora M. Gwin. Earl Adelbert Reed died on 2 March 1920 at age 29. Married Name 4 August 1920 As of 4 August 1920,her married name was Welton. Pearl R. Reed was born on 21 June 1892. She was the daughter of Frederick Dudley Reed and Elnora M. Gwin. Pearl R. Reed married Guy Elwood Welton on 4 August 1920. Pearl R. Reed died on 14 May 1972 at age 79. Guy Elwood Welton was born on 16 February 1891. He married Pearl R. Reed, daughter of Frederick Dudley Reed and Elnora M. Gwin, on 4 August 1920. Guy Elwood Welton died on 20 June 1952 at age 61. Name Variation Alfred John Davis was also known as John Alfred. Alfred John Davis was born on 22 September 1872 at Wisconsin. He was the son of (?) Davis. Alfred John Davis married Laura Blanch Gwin, daughter of David J. Gwin and Martha J. Reagles, on 7 August 1900. Alfred John Davis died on 12 September 1923 at age 50. Name Variation Jacob W. Davis was also known as Jake. Jacob W. Davis was born on 6 May 1858 at Wisconsin. Jacob W. Davis married Pearl A. Gwin, daughter of David J. Gwin and Martha J. Reagles, on 12 September 1885. Jacob W. Davis died on 11 October 1920 at age 62. [S244] U.S. Federal Census 1910 U.S. Federal Census, by Ancestry.com, ED98. Dwelling 17. Name Variation Kathryn C. Davis was also known as Kittie. Married Name Her married name was Hutchens. Kathryn C. Davis married Lora Aldis Hutchens. Kathryn C. Davis was born on 10 October 1893 at Wisconsin. She was the daughter of Jacob W. Davis and Pearl A. Gwin. Kathryn C. Davis died on 9 December 1968 at age 75. Name Variation Lora Aldis Hutchens was also known as L. A.
Lora Aldis Hutchens married Kathryn C. Davis, daughter of Jacob W. Davis and Pearl A. Gwin. Lora Aldis Hutchens was born on 24 September 1883. He died on 8 June 1974 at age 90. 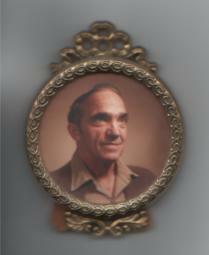 Name Variation John David Diserens was also known as Jean David. John David Diserens was born on 16 July 1796 at Canton De Vaud, Switzerland. John David Diserens died on 13 October 1867 at Grimes, Texas, at age 71. [S186] Illinois, Illinois Statewide Marriage Index, Vol I/ Page 32. [S249] U.S. Federal Census 1850 U.S. Federal Census, by Ancestry.com, Stamp 382. Stamp 763. Dwelling 285. [S248] U.S. Federal Census 1860 U.S. Federal Census, by Ancestry.com, Page 103. Stamp 271. Dwelling 682. Joseph Vernon was born circa 1800 at England. He married Margarett (?) before 1827 at England. Joseph Vernon died in September 1849. Joseph Vernon and Margarett (?) immigrated on 12 July 1849 to New Orleans, Louisiana, sail ship named Bark Blake. Married Name Her married name was Vernon. Married Name circa 1851 As of circa 1851,her married name was Stovall. Margarett (?) was born in 1804 at England. She married Joseph Vernon before 1827 at England. Margarett (?) married John Stovall circa 1851. Margarett (?) died after June 1860. Margarett (?) and Joseph Vernon immigrated on 12 July 1849 to New Orleans, Louisiana, sail ship named Bark Blake. [S249] U.S. Federal Census 1850 U.S. Federal Census, by Ancestry.com, Dwelling 8. [S248] U.S. Federal Census 1860 U.S. Federal Census, by Ancestry.com, Page 28. Dwelling 187. Henry Vernon was born on 6 June 1829 at Manchester, England. He was the son of Joseph Vernon and Margarett (?). Henry Vernon married Rosabelle Josephine Boswell circa 1859. Henry Vernon immigrated with Joseph Vernon and Margarett (?) on 12 July 1849 at New Orleans, Louisiana; sail ship named Bark Blake. [S248] U.S. Federal Census 1860 U.S. Federal Census, by Ancestry.com, Page 27. Stamp 37. Dwelling 177. George Vernon was born in 1845 at England. George Vernon died in October 1849. George Vernon immigrated with Joseph Vernon and Margarett (?) on 12 July 1849 at New Orleans, Louisiana; sail ship named Bark Blake. John Stovall was born circa 1810 at Alabama. He married Margarett (?) circa 1851. August Dieman was born in May 1847 at Prussia. He married Josephine M. Eranape circa 1874. August Dieman died on 25 July 1907 at Waukesha, Wisconsin, at age 60. 1 June 1905 Waukesha, Waukesha, Wisconsin He appeared on the census of 1 June 1905 at Waukesha, Waukesha, Wisconsin. August Dieman immigrated in 1865. He was a contractor and builder and proprietor of Fox River House in Waukesha Village in 1890. He lived in 1892 at Waukesha, Waukesha, Wisconsin, Occupation listed as contractor living at 95 Prospect Court. He lived on 20 October 1904 at 317 West Avenue, Waukesha, Wisconsin, registered to vote. [S247] U.S. Federal Census 1870 U.S. Federal Census, by Ancestry.com, Page 42. Dwelling 309. [S246] U.S. Federal Census 1880 U.S. Federal Census, by Ancestry.com, NA Film Number T9-1451 Page Number 284B. [S245] U.S. Federal Census 1900 U.S. Federal Census, by Ancestry.com, ED141. Dwelling 494. Name Variation Josephine M. Eranape was also known as Granope. Married Name circa 1874 As of circa 1874,her married name was Dieman. Josephine M. Eranape was born on 4 April 1849 at Prussia. She married August Dieman circa 1874. Josephine M. Eranape died on 10 March 1915 at age 65. 1 June 1905 Waukesha, Waukesha, Wisconsin Josephine M. Eranape appeared on the census of 1 June 1905 in the household of August Dieman at Waukesha, Waukesha, Wisconsin. Josephine M. Eranape immigrated in 1865. She had 7 with 6 living in 1910 children. [S247] U.S. Federal Census 1870 U.S. Federal Census, by Ancestry.com, Page 44. Dwelling 336. [S244] U.S. Federal Census 1910 U.S. Federal Census, by Ancestry.com, ED177. Dwelling 52. Bertha D. Dieman was born on 23 September 1876 at Wisconsin. She was the daughter of August Dieman and Josephine M. Eranape. As of 1920, Bertha D. Dieman was never married. She died on 3 April 1925 at age 48. 1 June 1905 Waukesha, Waukesha, Wisconsin Bertha D. Dieman appeared on the census of 1 June 1905 in the household of August Dieman at Waukesha, Waukesha, Wisconsin. Bertha D. Dieman lived in 1892 at Waukesha, Waukesha, Wisconsin, living at 95 Prospect Court. She lived on 27 December 1917 at California. [S243] U.S. Federal Census 1920 U.S. Federal Census, by Ancestry.com, ED166. Dwelling 480-566. Name Variation Oswald August Dieman was also known as O. A.
Oswald August Dieman was born on 10 May 1878 at Wisconsin. He was the son of August Dieman and Josephine M. Eranape. Oswald August Dieman married Lillian Z. Carlstedt, daughter of Leonard H. Carlstedt and Eliza Emma (? ), circa 1909. Oswald August Dieman died on 27 April 1960 at age 81. 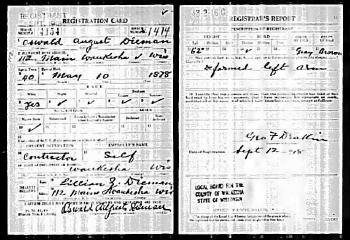 1 June 1905 Waukesha, Waukesha, Wisconsin Oswald August Dieman appeared on the census of 1 June 1905 in the household of August Dieman at Waukesha, Waukesha, Wisconsin. Oswald August Dieman lived with August Dieman on 20 October 1904 at 317 West Avenue, Waukesha, Wisconsin; registered to vote. On 25 June 1908 Oswald Dieman announces that he has been notified that he has passed the civil service exam for a position in the government service and has been ordered to report at Washington, D. C., to be assigned to work. He will be employeed as an inspector on concrete work on one of the big contracts, but does not know as yet to which point he will be sent. His salary will be $1,800 a year. On 12 September 1918 at WWI Draft Registration Card, Waukesha, Wisconsin, height 6 feet 2 inches, brown hair, gray eyes, noted with "deformed left arm." [S244] U.S. Federal Census 1910 U.S. Federal Census, by Ancestry.com, ED12. Dwelling 71. [S250] U.S. Federal Census 1930 U.S. Federal Census, by Ancestry.com, ED47. Dwelling 228.